The San Pedro Fire Department has a new sub-station officer. He is Newton Lennan, a native of Belize City who was raised in Benque Viejo Cayo District. Lennan took over the position that was held by previous sub-station officer who has retired. After thirteen years away from San Pedro, Lennan is excited to be back, and he looks forward to working with San Pedro residents and assist everyone however possible. Lennan holds a degree in Civil Engineering and Drafting from the University of Belize. His 17 years in the fire department has taken him to different areas around the globe. “I have attended different training programs in countries like the United States, Canada and Japan. At the moment, I am the only certified fire instructor in the department and I have been working in all the districts of the country, except in Toledo. Being back in San Pedro brings back memories, and I am bringing my expertise to benefit all the island residents,” said Lenan. The officer in charge also commented on the capacity of the fire station personnel and their relationship with the business sector. “Our staff gets training sessions every Wednesdays; this is something new that we hope to keep up. We will like to interact more with the public. 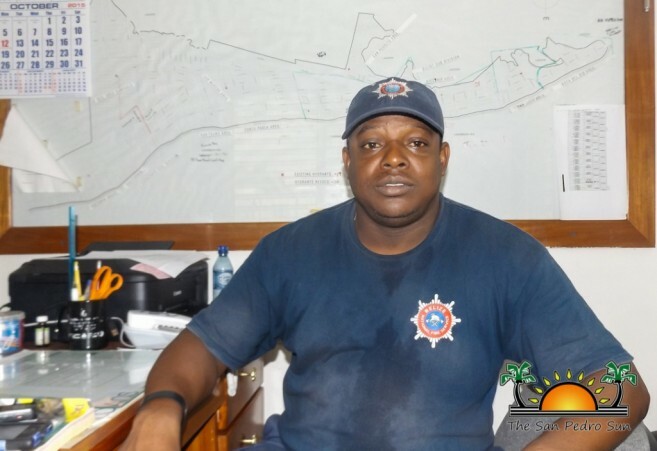 We have a program with Caribbean Villas where we initiated a sub portable pump pioneer project, whereby we will would to see a team of workers from the establishment get trained so in case of any fire emergency they know what to do,” elaborated Lennan. According to Lennan, such practice will not just make the fire department’s job easier, but it will also benefit the business establishment by having a fire team onsite, ready to respond and deal with the situation and minimize fire damage. “These are the type of practices I am going after. We have already started on one, and hopefully we can get more businesses involved in this initiative so we can reduce the risks of such unexpected disasters. My personnel is well trained and ready to conduct satisfactory training to employees from any business place that would like to join the program,” ended Lennan. As with other government organizations, the station welcomes any kind donations from the general public. Equipment such as a computer would make the day-to-day endeavors in their offices much easier. Another assistance the department is in need of is a vehicle that can pull a trailer in which the portable water pump can be transported to the area of the fire. Lennan would like to encourage everyone to work with them and remember that the fire station is open 24 hours and can be contacted directly at 206-2372, seven days of the week. The San Pedro Sun welcomes Sub-Station Officer Newton Lennan, and wishes him the best in his tenure on Ambergris Caye.